Although committees have calmed down and will only be holding informational meetings at this point, things have been very busy these last few weeks. I have been working on policy bills with colleagues on both sides of the aisle, as well as agencies, to make sure we have good policy for residents. It's unfortunate that politics seem to get in the way of policy in this building at times, (Click Here for comments in committee on bad policy) but I appreciate the bipartisan work I have been able to accomplish and continue to work on with my colleagues. 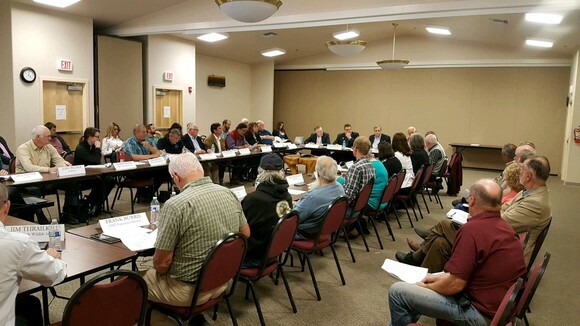 On Wednesday, May 31st, Senator Jeff Merkley and I co-convened the second full Sudden Oak Death Task Force meeting in Bandon. Last year, as a Curry County Commissioner, I worked with stakeholders, ODA, ODF and the legislature to secure funds to create a SOD Task Force. As we gathered stakeholders, I had repeated conversations with Senator Merkley on the issue and sincerely appreciate his interest to join me and continue our bipartisan work on this critical issue facing southwest Oregon. During our first full SOD Task Force meeting a few months ago, we set forth the ground work and created the subcommittees. The six subcommittee work groups have been working together to create recommendations for the strategic plan and implementation. Attendance at the second SOD Task Force meeting was exceptional, with local governments represented (I appreciate Curry County Commissioner Boice, who has been attending all the Task Force meetings he can, as well as Coos County Commissioners Cribbins and Sweet for their attendance) as well as Tribal governments, industry, agency personnel, interested citizens and facilitators with the Association of Oregon Counties. The full SOD Task Force reviewed the work from the subcommittees, discussed some minor amendments, and moved forward with their adoption of the Strategic Action Plan. I am working with my colleagues in Salem on funding through HB 3151 that I have drafted and with Senator Merkley on federal dollars. We can no longer afford to not adequately fund treatments for this deadly disease as both the EU1 and NA1 strains threaten billions of our States economy. I want to thank all the members of the SOD Task Force and the subcommittees for their diligent work. I want to thank Senator Merkley for his good work and bipartisan partnership on this critical issue. I want to thank USFS Forest Pathologist Ellen Goheen for her years of dedicated work on SOD, and ODF Forest Pathologist Sarah Navarro for all of her work and coordination on the same. I would also like to thank my friend and colleague, former Tillamook County Commissioner Mark Labhart, for his outstanding efforts in facilitating the SOD Task Force. We will be moving forward carrying out our Communication and Outreach Plans soon, so stay tuned for news on how you can assist. I was appointed by the Speaker of the House of Representatives to serve on the Pacific NorthWest Economic Region (PNWER). The Pacific NorthWest Economic Region (PNWER) is a statutory public/private non-profit created in 1991 by the states of Alaska, Idaho, Oregon, Montana, Washington, and the Canadian provinces of British Columbia, Alberta, Saskatchewan, and the Yukon and Northwest Territories. The goal of this organization is to promote greater regional collaboration to achieve economic growth while maintaining the region's natural resources. Click HERE for more information on PNWER. Our trade with China is a major component of our state's economic development. A few years ago, former Commissioner Itzen and I worked with local industry, ODA, and the USDA to successfully change the administrative rules on phytosanitary certification to give our cranberry, blueberry, strawberry and cherry agriculture producers the ability to have greater trade with Chinese markets. These four products have a $208 million dollar economic footprint in Oregon and now have the ability to grow their industries in trade with China. Many of our local farmers are utilizing these new rules for their industries and are receiving higher prices for their products. Oregon currently exports roughly $3.7 billion in products to China. Oregon has a special relationship with China through the Oregon-China Sister State Relations Council. This critical market is essential to our State's economy and the relationship is being acknowledged and encouraged through a bill I have drafted and chief sponsored, House Concurrent Resolution 39. On Thursday HCR 39 was voted out of the House Rules Committee on a unanimous vote. The bill now goes to the House floor and then to the Senate. In addition to my PNWER appointment I have also been appointed the Chair of the Southern Oregon China Connection of the Oregon-China Sister State Relations Council. I look forward to continuing to foster relationships and further developing trade relations that will benefit our industries in Southwest Oregon and throughout the state. I am sponsoring a number of bills that provide small and large economic development benefits for our region and the state. Friday, June 2nd, was the final deadline for legislation in all of the policy committees to have had a public hearing and a work session in the second chamber (House bills in Senate, Senate bills in House) are considered dead. I am happy to report that all of my 28 bills that I have chief sponsored have been approved by committee, signed into law or reside in a committee that is not subject to the deadline (Ways & Means, House or Senate Rules and Revenue committees). I sincerely appreciate my colleagues on both sides of the aisle for their bipartisan efforts and assistance in moving my legislation. Here are the bills that have passed out of committee and are on their way to becoming law. Click on the bill number to view the text of the bill. "We have reached a critical point in this session, and I am sorry but … I cannot vote for a budget that continues to cut our school funding and continues to maintain our mediocrity," said Hernandez, who also is a member of the Reynolds School Board. Rep. Diego Hernandez's no vote would have meant defeat for the $8.2 billion biennial budget for K-12 education. When Hernandez made it clear early Thursday, June 1, that he would vote no on the education budget, other members of the subcommittee summoned Ways and Means Co-Chairwoman Nancy Nathanson to the room. "We are suggesting we can make schools whole with PERS reforms, but it appears leadership and the Governor are not interested in doing anything real in this area. 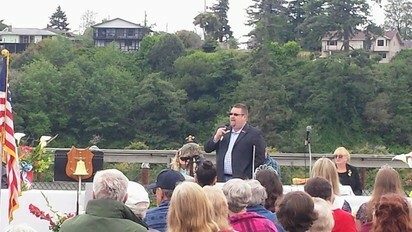 This is where politics out weighs real policy and solutions," said Senator Kruse (R-Roseburg). "The Governor is creating a taskforce to “study” the issue. We already know what the solutions are, but it appears some think the next election cycle is more important than real solutions." A proposed bill targeting evictions, housing stability and steep rents is heading to the Oregon Senate but only after losing some of its most controversial portions. Before the Senate Committee on Human Services moved House Bill 2004A to the floor with a "do pass" recommendation Wednesday, it adopted an amendment removing the rent control-like portion of the bill. House Bill 3465 would have redirected $50 million to Oregon Health Plan over insurance companies. Representative Cedric Hayden (R-Cottage Grove) expressed frustration as House Bill 3465 was referred to a “dead” committee by Speaker Tina Kotek (D-Portland) today. Without action taken on the measure, current statute requires that $50 million dollars in the Oregon Reinsurance Program to be sent back to insurance companies on July 1, with no requirement that those dollars be returned to ratepayers. House Bill 3465 was referred to the House Healthcare Committee. Legislative rules are clear that the only committees which can still entertain new bills are House Rules, Revenue, and Ways and Means. By referring the bill to the Healthcare Committee, the bill is effectively dead on arrival. House Bill 3465 is supported by the Eugene Register-Guard editorial board and the Independent Party of Oregon. The information would've remained a state secret -- except the state Department of Environmental Quality already released the same records to the newsroom without redactions, offering a complete picture of what Brown tried to shield from public view. Colleen Johnson, one of the fired commissioners, questioned the decision to shield the details from the public. "This just underlines even more strongly that something was going on and she didn't want Richard to be hired – and we took the punishment for it," Johnson said. "She's obviously trying to hide the rationale and hope that nobody would really push on it." Yet Another New Tax Proposal - Measure 97 "light"
With unprecedented tax revenues from citizens and businesses, Democrat leadership has proposed creating and/or increasing taxes similar to the failed Measure 97 that was defeated by residents last November. If the Democrats are unable to get one Republican vote to pass the tax in the Legislature (a three-fifths majority was put in place by the citizens and is constitutionally required to raise taxes) the teachers union is preparing to send it back to the voters, while taking away the citizen placed need for a three-fifths vote to increase taxes. One of Oregon's largest public employee unions is once again asking voters to raise corporate taxes, less than a year after they rejected the mammoth Measure 97. The Oregon Education Association is in the process of filing a November 2018 ballot initiative that could raise as much as $1.75 billion annually for K-12 and higher education through a corporate tax that would be assessed based on companies' sales. The teachers union is also filing a second initiative that would make it easier for the Legislature to raise corporate taxes to pay for education. It would do so by removing the current requirement for a three-fifths supermajority to increase taxes to pay for education in some circumstances. 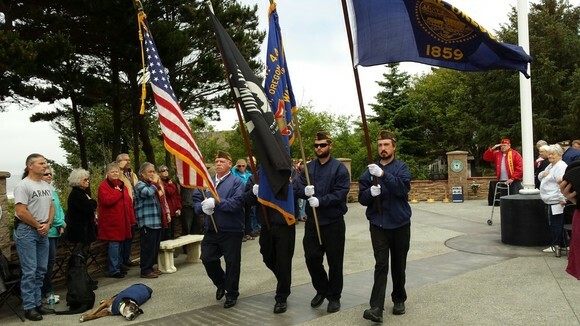 Honored to be the Guest Speaker at the Memorial Day Ceremony at the Port of Brookings-Harbor. Thank you to VFW Commander Bremer for the invitation and beautiful ceremony. 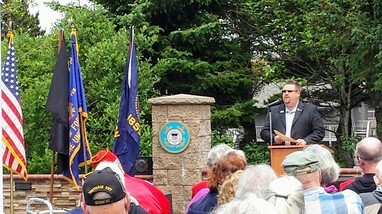 Equally honored to speak at the Memorial Day Ceremony in Gold Beach at the Curry County Veterans Memorial. Thank you to John Bell for the invitation. 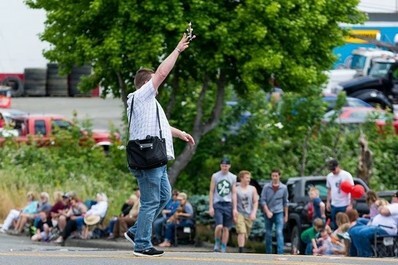 Annual Gay 90's Festival and Parade in Coquille, Oregon. This celebration has been going on for decades and this years theme was, "Heroes, Heroines & History". Lots of things going on including the street fair, parade, car show and live music. 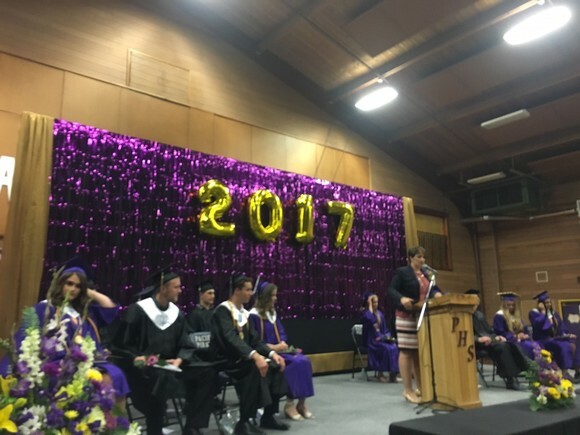 Congratulations to the Pacific High School Class of 2017! Over $200k in scholarships were awarded to these exceptional young men and women at Saturday's graduation ceremony. Thank you to the parents, friends, family, community, staff, teachers and administrators, for all of your great work assisting these young adults on their journey and giving them the tools to succeed. A big thank you to my colleague School Board members for all of your work for our district and your understanding. 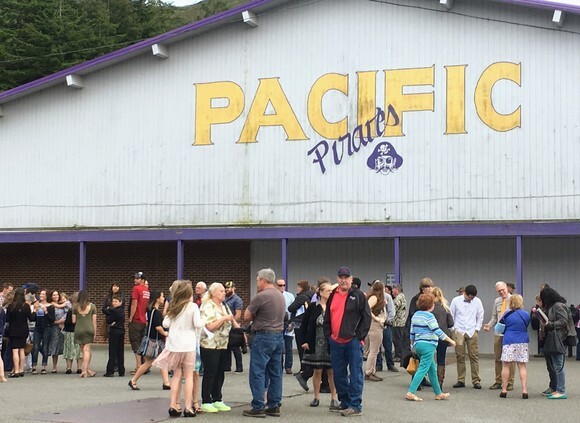 Good luck graduates and Go Pirates! With roughly five weeks of session left anything is possible. I'll quote our Senator Kruse from his recent news letter and I appreciate his insight. "At this point it would be pure speculation as to what major policy issues will be brought forward over the next couple of weeks. We should just be dealing with budgets, but I am sure we will see other issues as well. The Speaker is still calling for two billion dollars in tax increases, even though there is a pathway to a balanced budget without tax increases. In addition, she is taking a purely political position on the low carbon fuel standard that could jeopardize the transportation package. From my perspective as a minority member of the Senate, it appears the Governor and the Speaker of the House are taking a hard line while the Senate President is trying to find middle ground. It will be interesting to see how this plays out over the next few weeks." It will indeed be interesting, as we continue to work for our residents of Southwest Oregon, their communities and the industries that support them. It is an honor and a privilege to work for you as your State Representative and I thank you for the opportunity. God Bless you and your families.